Piney Forest is home to many creatures, but Boris and Henry play and live by themselves on its edge, shunned because they do not look like everyone else, have other ways of walking and talking, and do things differently. When danger threatens their forest home, they must warn those who have bullied or shunned them and lead them to safety. In the end it is clear that Boris and Henry are just like everyone, that we all are. 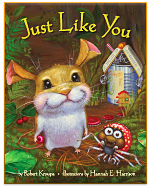 Just Like You is the simple tale of two friends with different abilities, a story for young children created in part as response to the epidemic of bullying. When values of acceptance and kindness are instilled early, children's minds and worlds expand. Author and philanthropist Robert Kroupa had a small friend, Frankie, who lived with her wheelchair-bound aunt, a grandmother with Alzheimer's, and a grandfather debilitated by a stroke. When Frankie looked at her family she saw only them, not their disabilities. Inspired by Frankie's compassion and the tenacity and courage of patients at the Rehabilitation Institute of Chicago and Robert's own childhood experiences with being bullied, Robert wrote this story for young children to encourage them to accept, appreciate and celebrate the similarities and differences in all of us. Robert has carried his vision further by creating the Just Like You Foundation, with a mission to insure that children, no matter their abilities or differences, are celebrated and nurtured. Profits from the sales of this book will go to the work of Just Like You Foundation and organizations it works with to benefit children.